Flow cytometric analysis of MDA-MB-231 cells (blue) and Jurkat cells (green) using Coronin 1A (D6K5B) XP® Rabbit mAb (PE Conjugate) (solid lines) or a concentration-matched Rabbit (DA1E) mAb IgG XP® Isotype Control (PE Conjugate) #5742 (dashed lines). 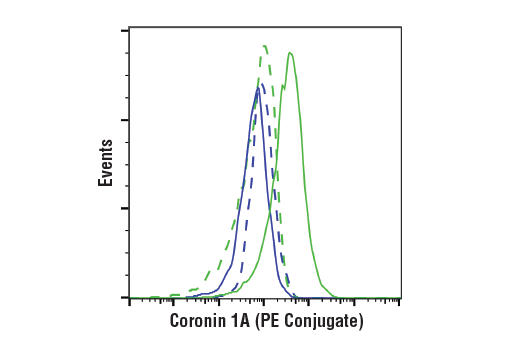 Coronin 1A (D6K5B) XP® Rabbit mAb (PE Conjugate) recognizes endogenous levels of total coronin 1A protein. Based on the sequence of the immunogenic peptide, this antibody is not expected to cross-react with other coronin protein family members. Monoclonal antibody is produced by immunizing animals with a synthetic peptide corresponding to residues surrounding Val200 of human coronin 1A protein. This Cell Signaling Technology antibody is conjugated to phycoerythrin (PE) and tested in-house for direct flow cytometric analysis in human cells. The antibody is expected to exhibit the same species cross-reactivity as the unconjugated Coronin 1A (D6K5B) XP® Rabbit mAb #92904. The coronin family of actin-binding proteins regulates a variety of cellular functions, including migration, phagocytosis, and cytokinesis. Coronin 1A is highly expressed in lymphocytes, and is required for appropriate immune regulation in mice and humans. Researchers are investigating coronin 1A as a potential therapeutic target for autoimmune diseases and lymphoid cancers (1,2). Coronin 1A affects bone resorption through its regulation of lysosome fusion and secretion of cathepsin K in osteoclasts (3). In the nervous system, coronin 1A has been shown to regulate GPCR signaling and neurite outgrowth (4,5). Punwani, D. et al. (2015) J Clin Immunol 35, 100-7. Siegmund, K. et al. (2016) J Biol Chem 291, 22086-22092. Ohmae, S. et al. (2017) Sci Rep 7, 41710. Martorella, M. et al. (2017) Vitam Horm 104, 113-131. Terzi, Y.K. et al. (2014) Neurosci Lett 582, 38-42.